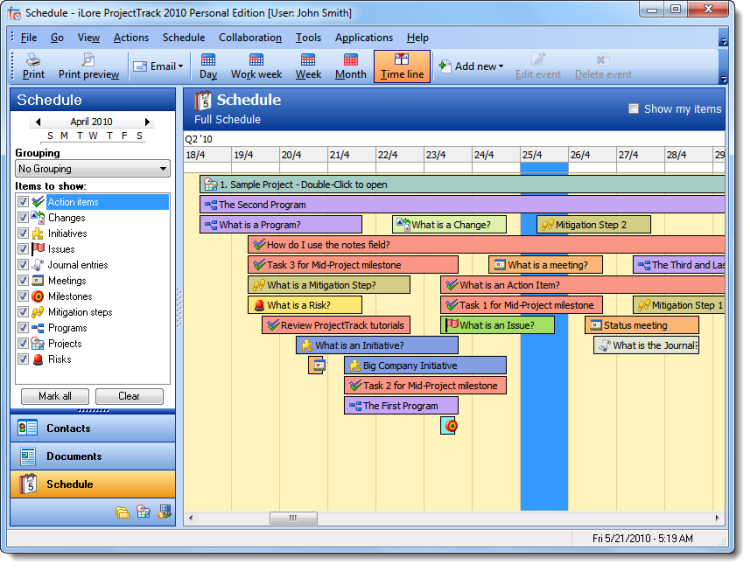 ProjectTrack Personal Edition is an inclusive software program that will help you execute your plan. It integrates all the tools and information that you need to manage any kind of project, big or small. Keep track of your tasks, issues, risks, meetings, changes, contacts and even documents. Collaborate and share data with your team members, clients and sponsors. No other tool on the market more completely manages projects from start to finish. * Centralize all your project DOCUMENTATION. No more searching for documents. Link, store, find, open and send documents from ProjectTrack. * Easily COMMUNICATE with clients, sponsors and your team, without switching applications. * Maintain a project JOURNAL, so nothing is left to memory. * Do you work with MULTIPLE CLIENTS? MULTIPLE PROJECTS? ProjectTrack can handle it. * START the day with ProjectTrack TODAY. It will show you of the status of your projects and what needs to get done. * FILTER information, by creating data filters in plain English, so you can look at what's important to you. * SPELL-CHECK (in more than 20 languages) what you write, while you write it, and use the included THESAURUS to find the perfect word. Qweas is providing links to ProjectTrack Personal Edition 2010.10.31 as a courtesy, and makes no representations regarding ProjectTrack Personal Edition or any other applications or any information related thereto. Any questions, complaints or claims regarding this application ProjectTrack Personal Edition 2010.10.31 must be directed to the appropriate software vendor. You may click the publisher link of ProjectTrack Personal Edition on the top of this page to get more details about the vendor.